Rotary ATP synthases are the key elements in cellular bioenergetics. Despite the vast variety of enzymes used in eukaryotes, bacteria, and archaea to couple substrate oxidation to energize their membranes, they all have a multisubunit macromolecular rotary ATP synthase in common that is used to drive the synthesis of ATP at the expense of the electrochemical ion potential present across the membrane. All rotary ATPases arose from a common ancestor and shared the same principle domain organization and function as ATP-driven ion pumps, but evolved differently in terms of subunit composition, regulation, and function as ATP synthases. Archaeal A1AO ATP synthases are similar in subunit composition to eukaryotic V1VO ATPases, but in contrast to the latter work as ATP synthases in vivo. Due to the work of many laboratories world-wide, it is now well established that the F1FO and A1AO ATP synthases consist of two coupled motors, a chemically-driven hydrophilic motor (F1 and A1) that resides in the cytoplasm of prokary-otes, and an ion motive force-driven motor (FO and AO). One motile central as well as one or more peripheral stalks connect both motors. In the ATP synthesis mode, ion flow through the membrane motor drives rotation of the motor subunit c ring against the stator, subunit a. Rotation of the c ring is then coupled to rotation of the central stalk that interacts with the soluble motor to synthesize ATP. 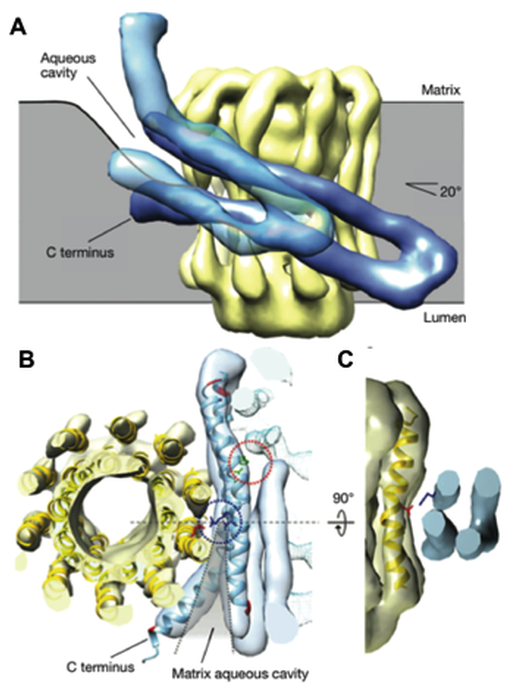 By combining structural biology, biochemistry, biophysics, and microbiology, the CRC 807 addresses key questions on the structure of the membrane motor, the mechanism of ion transport, the coupling of ion transport to torque generation and rotation of the c ring, and the coupling of c ring rotation to the rotation of the central stalk. Cryo-EM structure revealed the horizontal membrane-intrinsic α−helices in the subunit a of an F-type ATPase (blue). A) View from the dimer interface (c10-rotor ring, yellow). B) Matrix view. C) Orthogonal section through the c ring.